The Social Giant Facebook Is Pushing Video Content In Its App. This Time With A New Feature “Instant Videos”. No Doubt A Lot Of Videos Daily Watched By Facebook Users In News Feed. Facebook Is Also Pushing Video Content, Recently They Announced Facebook Watch Tab-A Separate Place For Videos. Social Giant Facebook Takes Next Step To Push Video Content With “Instant Video”. Facebook Already Has A Feature In Its App Called “Save”. With This Feature One Can Save Videos In Facebook App And Later Watch It Without Using Mobile Data. 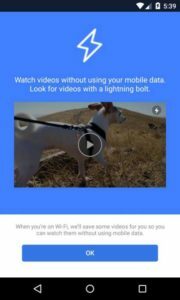 If You Use Wi-Fi To Browse Facebook, Then Upcoming “Instant Videos” Will Automatically Save Some Videos For You. You Can Watch Saved Videos Later Without Using Internet Or Mobile Data. You’ll See A Bolt Icon At Top Right Of Video Thumbnail Which Means That Video Is Instant Video. Means You Can Watch It Without Using Data. Facebook Already Provide Instant Articles Feature That Loads Faster Than Normal. Instant Articles Technique Launched To Load Web Pages More Faster Even On Slow Network. Videos Loads Slow As Comparison To Web Page, So Instant Videos Will Be Useful For Users. This “Instant Videos” Feature Also Provide Benefit Facebook’s New Watch Tab-A Separate Place For Videos, Shows. This Will Save Some Videos For You And You’ll Be Able To Watch It Later When You’re On A Place Where Internet Connection Is Not Strong. Many Users Watch Videos On Wi-Fi Instead Of Mobile Data Because Data Cost Is Very High In Some Areas. So, Facebook Goal Is To Remove Data Cost Barrier To Watching Its Videos. This Also Benefit For Facebook In Terms Of Monetization Of Videos. Facebook Is Starting To Allow Publishers To Insert Ads Break In Videos. More Video Views Means More Ads Views Also. There Is Also A Problem With This Feature. Facebook When You’re On Wi-Fi Will Save Some Videos For You So You Can Watch Them Without Using Mobile Data. This Will Eat Your Space Too If You Are Not Interested In Those Videos. Facebook App Already Consume A Lot Of Space In Your Device. If This Feature Rolled Out, Videos Start Saving To Your Device Automatically And Fill With Useless Videos. However, This Feature Is In Testing In Android App For Some Users Or May Come With A Selective Option So That Users Can Opt Out Either To Save Automatically Or Not.